Formerly Supergreens Berry Burst- New and Improved Formulation! 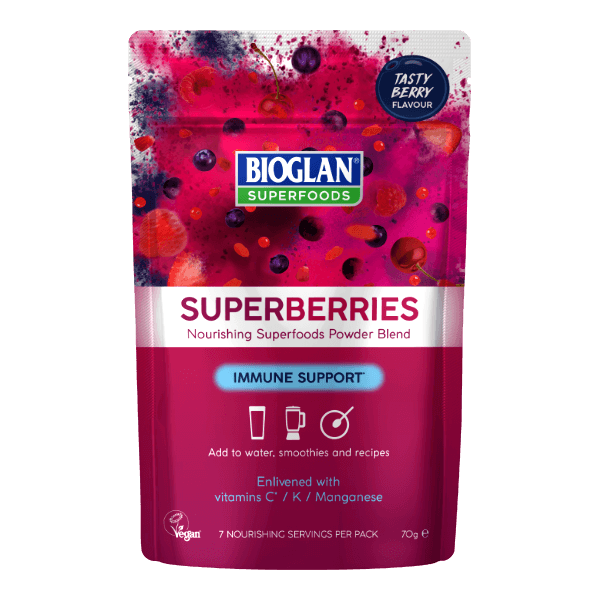 Superberries is an immune supporting blend of colourful berries and superfoods including goji, acai, pomegranate and coconut water. It’s also been enhanced with added vitamins C, K, manganese, folic acid and magnesium which means each serving is bursting with goodness. With a great natural berry taste, and containing only naturally-occurring sugars, Superberries is a convenient powder that’s easy to add to everyday foods and drinks. No time to spare? Just mix 2 teaspoons (10g) with 200 - 300ml of water for a great tasting, nutritious drink any time of the day. Inulin, Goji Berry Fruit Powder (17%), Beetroot Powder, Pomegranate Powder, Coconut Water Powder, Natural Flavouring (Anti-Caking Agent: Silicon Dioxide), Magnesium Citrate, Acerola Blend (Vitamin C, Roasted Carob, Anti-Caking Agent: Silicon Dioxide), Açai Freeze Dried Berry Powder (3%), Blueberry Juice Powder (1%), Strawberry Powder (1%), Raspberry Powder (1%), Redcurrant Powder, Montmorency Cherry Freeze Dried Powder (1%), Bilberry Powder, Vitamin K1, Folic Acid, Manganese Sulphate.